Why and How is Watson a Cognitive System? Good thoughts about who is in control, and how. Will this be solved by more autonomy of the organization to react to changes in data? Organizations I work with increasingly struggle to straddle two painfully polarizing operating principles. On the one hand, they desperately seek greater agility; on the other, they genuinely want to include all the right stakeholders in their processes. This conflict uncomfortably transcends traditional “centralization/decentralization” debates. Customers and clients demand greater agility, and employees and partners expect greater empowerment. So the companies push hard to provide both. ... "
And IBM makes a play with linking enterprise data and data science. Very important, especially for ongoing applications, to have process, data and analytical methods continually aligned and updated. All this aims at better process improvement. While the gears of research are turning fast developing new methods of machine intelligence, another, perhaps more impactful, trend is brewing in the field. Open source frameworks like Apache Spark are hitting their stride at the ideal time to put data analytics in the hands of the business development analyst without forgetting about the needs of the data scientist. IBM’s new Project DataWorks is built with both Spark and IBM Watson at its core to prioritize speed and usability without sacrificing robust analytics. The best way to think about DataWorks is as a sort of Google Docs for data analytics. In practice, companies have huge data libraries that often end up in a variety of decentralized locations. IBM’s new product eats all this company data and puts it in one intuitively accessible place. ..."
Microsoft continues the move towards more democratized AI. Certainly from their efforts like Cortana, but don't forget the proposed acquisition of Linkedin and the integration of massive networks representing people and their skills. That could model the very kinds of organizational operations that AI methods could trim, augment and even replace. Making that people plus bot network more intelligent is a very big leverage point. From O'Reilly, Some key unresolved issues of practical AI. What explains the gap between what machines do well and what people do well? And what needs to happen before machines can match the flexibility and power of human cognition? ,,, "
Quite a lengthy, complete and interesting view I am looking at. In Linkedin. Credit goes to my colleagues Sumit Pratap Singh, Prateek Sharma, Kuntal Basu and Subhamoy Ganguly for delving deep into this field and creating an outstanding capability in this much talked about field. The article below is the first of a series of articles, which we intend to publish over the course of the next few days, and is an attempt to articulate the wisdom and share it with a wider audience, so that others can benefit from it. Hence, I have called it a master class as there is a touch of pedagogy in this attempt to carve out the essence of a complex topic. One of the areas of analytics/data science that has generated a huge amount of hype and interest of late, in the industry has been “sentiment analytics”. And yet, interestingly, though a lot of research and investment has gone into it, there haven’t been many takers for it from the point of view of business users. One of the major reasons for it has been that sentiment analytics has to deal with a lot of noise in the data, which the conventional, automated, “plug and play” solutions can’t handle. A lot of folks in the industry tried to come up with tools and products and trivialized “sentiment analytics” into a product play and hence, nipped an emerging industry in the bud. A well-executed sentiment analysis needs a lot of human intelligence to interpret the results as well as to coach the self-learning algorithms to do the right things. In this series of three papers, which we can call the “Sentiment Analytics Trilogy”, we provide a successful approach to performing sentiment analysis that gives outperforms the droves of so called “sentiment analytics products and tools” in the market, which are mostly unstable and error prone. ... "
Like the bare statement of the idea, not that I understand the implementation. Detailed below. Companies transforming alongside new digital disruptors are often talking about minimum viable products (or, better yet, minimum lovable products). But there’s one more “minimum viable” category that these businesses should be considering—minimum viable bureaucracy (MVB). Bureaucracy tends to have a very negative connotation, especially in agile companies that are more free-flowing than traditional enterprises. However, Mozilla and Spotify have made MVB a popular approach in agile businesses, giving executives an answer to the ever-present question—how do we maintain efficiency and consistency at scale without hindering creativity? It’s easy to theorize about implementing MVB, but practical implementation is much more challenging. The following insights into real-world MVB implementation should provide a clearer path toward balancing agility and governance. .... "
I was reminded today of Lowes and Hololens via Ignite A natural use case in the design and evaluation realm. Lowe’s has a long history of helping people reinvent spaces, quite literally, from the ground up. And home improvement is an incredibly visual undertaking. It can be difficult to conceptualize a full-scale remodel using just sample squares and paint swatches. We were excited to partner with Lowe’s to help reinvent visualization and design in a whole new way, using holograms. Using HoloLens, Lowe’s is providing customers in select pilot stores with a new way to experience home improvement. Lowe’s is using HoloLens to demonstrate a variety of design options for kitchen cabinetry, countertops, appliances and features like backsplashes, in a visually-rich and interactive way. Lowe’s customers will be able to experience a holographic representation of a completely new kitchen, adjust finishes and options instantly, and share their designs easily online. ... "
A number of useful points are embedded here. Useful to know these objections, since they will be brought up by thoughtful management. These are high level observations. I am not sure I would call all of these 'myths'. They all have elements of caution and truth to them, but the author also suggests under what contexts they might be true or not. In the real world you are always under some assumptions for any kind of useful modeling, so its useful to know what they are. Machine Learning Myths. Tom Davenport gave this talk to our Columbia University Adjunct group for the School of Professional Studies, recording below. He also mentions me and some of our work at P&G. I verified the link works, but not sure how long the link will be active. He has insightful and non technical thoughts on how analytics and AI will work in real world conditions. Worth understanding.
" ... The talk is called "Four Eras of Analytics". He traces a bit of the history of how the field develops. The focus of his new book is the age of "machine learning". In particular, he focuses on the paradigm of augmentation and discusses how managers design work processes to capture the relative strengths of humans and machines. All very relevant to our program. ... "
Talk Given Today: Mohammad Sadoghi “ExpoDB: An Exploratory Data Science Platform” ... " ... Insight is lost in islands of data ... "
Slides. Recorded talk will be here. An area we explored on the coffee blending business. Was still very primitive in capabilities at the time. Some advances are seen here. How can resulting data be connected to blending or manufacturing data? In New Scientist. Nvidia blog writes about deep learning and reinforcement learning with examples. Once again, I like considering the approach because it can have similarities to real world process. See previous notes on the topic. The world's biggest technology companies are joining forces to consider the future of artificial intelligence. Amazon, Google's DeepMind, Facebook, IBM and Microsoft will work together on issues such as privacy, safety and the collaboration between people and AI. Dubbed the Partnership on Artificial Intelligence, it will include external experts. One said he hoped the group would address "legitimate concerns". "We've seen a very fast development in AI over a very short period of time," said Prof Yoshua Bengio, from the University of Montreal. ... "
Note Apple is not yet involved. Similarity to OpenAI. Understanding where shoppers congregate and linger adds some science to in-store merchandising that has traditionally been done by gut instinct and employee observations. Dead zones can point to problems with traffic flow that may inspire shelf or layout changes. ... "
I was reminded of the Ohio Supercomputing Center, and their blog. For small- to medium-sized companies to keep pace with both their customers and their competition, they need a technological advantage. That advantage might just be modeling, simulation and data analysis, and that's where AweSim comes in. But where exactly are we going? How can we get there? And how can we engage? .... "
P&G, GM and Facebook Agree: Big Is Beautiful By Jack Neff. Facebook has drawn unwanted scrutiny of late over how it counts video viewership and the usefulness of its ad targeting, but a Town Hall panel discussion with executives of two of the biggest advertisers in the world -- Procter & Gamble Co. and General Motors – suggests they still have plenty of love for the social network. Two things were clear from the session that brought General Motors CEO Mary Barra and P&G Global Brand Officer Marc Pritchard on stage with Facebook Chief Operating Officer Sheryl Sandberg. They now see a platform long touted for its ability to deliver highly personalized messages largely as a mass medium. And gender equality will continue to be fundamental to the messages of all three – with an emphasis even on backing the talk with concrete steps to bolster the place of women in their own ranks and, at least in the case of P&G, at its agencies. In this Big Data world, a major goal for businesses is to maximize the value of all their customer data. Most customer data, however, are housed in separate data silos. While each data silo contains important pieces of information about your customers, if you don't connect those pieces across those different data silos, you're only seeing parts of the entire customer puzzle. The integration of these disparate customer data silos helps your analytics team to identify the interrelationships among the different pieces of customer information, including their purchasing behavior, values, interests, attitudes about your brand, interactions with your brand and more. Integrating information/facts about your customers allows you to gain an understanding about how all the variables work together (i.e., are related to each other), driving deeper customer insight about why customers churn, recommend you and buy more from you. ... "
SAP's $2 billion, five-year plan is to to extend its reach into the internet of things. SAP has bought IoT software developer Plat.One, marking the start of a plan to invest $2 billion in the internet of things over the next five years. Another compoent of SAP's IoT plan is to acquire new businesses, the latest of which is Plat.One. This company makes a platform that helps smart devices talk to one another and with a central database, translating between the different protocols they use to communicate. Plat.One says it manages 200,000 devices for 25 enterprise customers, including three telecommunications companies: BT, T-Systems and Telecom Italia. ... "
Glassholes, rejoice! Your hopes and dreams are about to be fulfilled by a $129 pair of video-recording Spectacles that its creator calls a "toy." But while they are going to be super-fun to play with, Snap Inc.'s Spectacles are a serious brand extension for the company that created ephemeral visual conversation. ... "
In IEEE Spectrum, some remarkable things that drones can now be programmed to do, like fly through half open windows. Out of UPenn's labs. Demonstrated in video at the link. Gives me considerable pause about what our drone and robotic enabled future will look like. For now, keep your windows completely closed. There are dozens of messaging apps, and each has its own unique list of features. For example, iPhone users may feel compelled to choose between Apple's iMessage, which which recently gained the ability to run iMessage apps, and Allo for iOS. 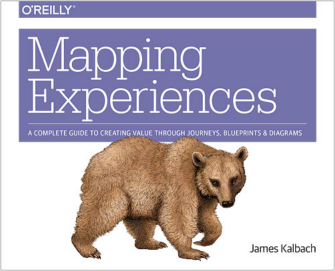 Mapping Experiences CoverOne of the most common questions I get in my workshops on mapping is, “How do I begin?” Aspiring mapmakers may see the immediate value in these techniques, yet they have barriers getting started. Getting stakeholder buy-in is a common challenge. I’ve been fortunate to have had opportunities to create diagrams of all kinds and have found that stakeholders see the value in mapping only after the process is complete. As a result, initiating an effort requires convincing them up front. .... "
Ultimately you will need AI/Cognitive to drive complex analytics. People alone cannot control the complex process, especially when you need to circle back to get new illustrative data. Here a panel on the topic reported on in SiliconAngle. Not detailed enough, but it sets up the idea. Had not heard the term 'Tribal Knowledge'. But OK, call it key internal strategic and operational knowledge within a company, from its own internal experts, external sources, written documents, external consulting and beyond. And effectively leveraging that knowledge against company problems. A key to a digital company? We explored the idea using methods like Wikis and rule based systems in the 90s, Interviewing retiring experts, Intranet search, Knowledge Management, Semantic networks linking to data and beyond. Each had its own positives and negatives. How can this be done better with cognitive methods.? Below a interesting example. I Like the thoughts, but how does it work in practice? How is the knowledge assembled and maintained for use? Woodside, Australia’s largest independent energy company has been a global leader in oil and gas for over half a century. Their secret? Hire and develop heroes. This formula has helped Woodside build some of the largest structures on the planet, in some of the most remote parts of the ocean, and safely transport the energy they produce to people around the globe. To ensure the next generation could successfully carry the torch, Woodside knew they had to harness the instinctual know-how of their best employees. This goal — to create a cognitive business to augment and share their tribal knowledge — is what led Woodside into an industry-first partnership with IBM and Watson. .... "
A market place for artificial intelligence solutions. Open AI. Mentioned previously, have not seen any implementations using this as yet. What aspects of such systems are 'open'? The algorithmic elements or how they are strung together to be cognitively intelligent? Short NYT piece that mentions a number of AI software efforts. But this seems to be a mix of analytics and data science with Cognitive/AI. True these two domains will often be mixed in application, but they should be separately understood. Machine learning is a technique and data focused approach. Cognitive/AI systems are adaptable and learning systems than can interact with language, leveraging structured knowledge. Note that its not the data used that has to be structured, but the semantic knowledge in context that needs to be. So something like IBM Watson attempts this, but GE Predix does not. In an effort to reach its target audience of influential business executives in New York City, Thomson Reuters is taking over Grand Central Station with a month-long campaign. The takeover, which begins today, includes billboards, videos, mobile and social, and is part of Thomson Reuters' "The Answer Company" campaign, which launched last year. The push was created by TBWA/Chiat/Day, New York. "The Grand Central Station takeover is the first execution we have developed, in conjunction with TBWA, that we call 'hyper-mega,'" said Stephen Sonnenfeld, VP-advertising and brand integration at Thomson Reuters. "We are delivering a very concentrated message to a very targeted group of people within a very specific geographic environment," he said. "This makes the best use of our media budget and puts our presence directly in front of the people who are most important to us." Those people are business professionals who work in the four core industries Thomson Reuters serves: legal, risk management, tax and accounting, and media. "The core of our brand challenge is to really get people to understand the scope of what we do as a company," Mr. Sonnenfeld said. "We have a fair amount of people who may know us well in a particular industry, but may not know what we do in other industries." Thomson Reuters is taking over all of Grand Central Station's ad inventory for the month of September, and will blanket the terminal, tunnels and train station with billboards that ask questions "that are keeping our target up at night," Mr. Sonnenfeld said. .... "
Lopez Research group report, via Cisco. report requires registration.
" ... Improve Business Operations with the IoT .... The Internet of Things can help you improve business efficiency, control intelligence from a wide range of equipment, enhance operations, and increase customer satisfaction. This Lopez Research Brief outlines the business benefits of the IoT and explains the steps to get started. Download the brief to see how you can take advantage of these IoT opportunities. .... "
Was recently re-introduced. http://www.kmworld.com/ Had read it for years, but not recently. KMWorld Magazine is free to qualified subscribers and is published monthly, with combined issues July/August and November/December. Subscribe today for free! Our newsletter, KMWorld Newslinks is also available free to qualified subscribers. KMWorld has an ongoing series of web events on the latest trends and best practices in knowledge management. Jim Spohrer sends along a link to a talk by Rob High, IBM Chief Technology Officer, Fellow and Vice President, Does a good job of discussing why Watson is cognitive, unique, and why it differs from previous attempts at delivering expertise. Non technical. I ask: So how you convince a complex organization this uniqueness is useful, stable and scalable? Only through clear operational examples in varying contexts. That appears to be what they are working on. This IBM Redguide™ publication describes how Watson combines natural language processing, dynamic learning, and hypothesis generation and evaluation to give direct, confidence-based responses. In particular an interesting example, because I buy Tide Pods via Amazon Dash. Supply Chain Graphic of the Week: The Very High Cost of eFulfillment Profitable In-Store Products Move Turn into Losers when Sold On-Line and Delivered to Homes SCDigest Editorial Staff .. "
Lots of interesting details at the link. Automation targets tasks first, people second. That's mostly good news for those willing to adapt. "The problem with new tech is it’s really easy to imagine the jobs it will destroy," Andreessen Horowitz's Chris Dixon recently told Product Hunt, "but really hard to imagine the jobs it will create." But it isn't quite that black and white. Many of the first "new" jobs automation will create will actually be similar to the ones it does away with. That's because, rather than destroying entire roles, it’s much more likely to chip away at certain work-related tasks. Many (though not all) positions will remain, but certain aspects of those positions will change, requiring workers to adapt to different, often higher-level activities in order to stay competitive. ... "
In the Gartner blog: On algorithmic merchandising. Good thoughts in the importance of data, process and analysis used with more concise and repeatable algorithmic methods.
" ... By 2020, merchant leaders will be algorithms, prompting the top 10 retailers to cut up to one-third of headquarters merchandising staff. Smart machines using algorithms will make complex decisions, such as merchandise assortment and distribution, product pricing and marketing messages. The algorithmic economy is coming alive for multichannel retailers as they continue to seek better ways to drive decisions through advanced analytics. Some algorithms will be ubiquitous, and shared for the betterment of the industry. Others will be more directly aligned with the interests of the retailer, “the secret sauce,” and, as such, kept confidential. As the number of algorithms grows, and the quality variations expand, retailers will find that the management of algorithms will require an expert to oversee how they are cared for (which ones can be shared), and which ones provide even momentary competitive advantage. ... "
McKinsey does a good job of explaining, in a non-technical way, why these technologies will be important. Provides a sketch in oil and gas of how they can be used to produce value. The time line of a decade is a reasonable forecast to universal use. Of course it will vary, and unexpected new things will emerge, some will be re-named, embedded and combined, but none of these things will be unimportant ten years from now. Over the next decade, mobile, the Internet of Things, machine learning, robotics, and blockchain technologies will change a great deal about how the oil and gas industry works. ... "
In KDNuggets, summary of a poll done with data scientists. Indicating the use of techniques by practitioners. Not too surprising. Much more detail about the results at the link.
" .... New Gartner research explores how retailers gain competitive advantage through the application of algorithms that reduce costs and grow top-line revenue. CIOs can use this research to identify use cases that will improve business performance in the unified commerce retail marketplace. Gartner describes algorithmic business as the “enablement of business value through the action of algorithms on data” and regards algorithms themselves as a way to encapsulate and produce intellectual property, knowledge and insight in a reusable form. Algorithms are a set of rules for solving a problem in a finite number of steps, as for finding the greatest common divisor. New technologies create opportunities to advance algorithms, incorporating many more data inputs and steps and even decision-making capability. ... "
A favorite topic, see previous posts below. Learn how your company can significantly improve procurement analytics to solve business questions quickly and effectively. By Federico Castanedo ... "
The truism “nothing ventured, nothing gained” is an often heard phrase. But risk-taking must be balanced with prudence. Karen Firestone, chairman, CEO and co-founder of Aureus Asset Management, knows how to strike that balance. She lived it herself — leaving a fund management job at Fidelity Investments after 22 years to co-found a wealth advisory firm in 2005. It worked out: Aureus now has $1.5 billion under management. Firestone wrote about the topic in her book, Even the Odds: Sensible Risk-Taking in Business, Investing and Life. She discussed her book on the Knowledge@Wharton show on Wharton Business Radio’s Knowledge@Wharton show, which airs on SiriusXM Channel 111. ... "
More on biases of algorithms. Inevitable, and will require new kinds of transparency that require deep contextual expertise. Only governments and big tech enabled companies will have these. Which do you fear most? Personal or group or government biases can be added to an algorithm quite easily. It won't be the market choosing. More hidden than rogue. Most of us, unless we’re insurance actuaries or Wall Street quantitative analysts, have only a vague notion of algorithms and how they work. But they actually affect our daily lives by a considerable amount. Algorithms are a set of instructions followed by computers to solve problems. The hidden algorithms of Big Data might connect you with a great music suggestion on Pandora, a job lead on LinkedIn or the love of your life on Match.com. Why does machine learning work? And I would add, what does 'work' mean? A look into the mysterious world of neural nets, which are not new, we used them for practical, though simpler applications, decades ago. We should be reminded that the computational neural nets in use are inspired by the networks in our brains, but are also very different. Is architectural inspiration enough? As we expand their use, for what kinds of problems are they best used? Video from O'Reilly, requires basic registration. As a technical founder at Siri, Sentient, and Viv Labs, Adam Cheyer has helped design and develop a number of intelligent systems. Drawing on specific examples, Adam reveals techniques he uses to maximize the impact of the AI technologies he employs. The industrial revolution shifted workers from farms to factories. In the first era of automation, machines relieved humans of manually exhausting work. Today, Era Two of automation continues to wash across the entire services-based economy that has replaced jobs in agriculture and manufacturing. Era Three, and the rise of AI, is dawning. Smart computers are demonstrating they are capable of making better decisions than humans. Brilliant technologies can now decide, learn, predict, and even comprehend much faster and more accurately than the human brain, and their progress is accelerating. Where will this leave lawyers, nurses, teachers, and editors? ... "
Nicely done, reminds me of some books at the end of the last AI era that turned out not to be very relevant. Moving generalized intelligence into multiple kinds of hardware. Review: The CoWatch -- a smartwatch with the voice of Alexa ... With solid hardware design, an Android-based OS and with Amazon's Alexa voice control, the CoWatch has potential. .... "
I have mentioned before this is a problem we addressed for several AI oriented applications. We called it 'image recognition'. Now the general solution is open source. Some samples images in the article, and they are impressive. The general solution of this captioning problem is an important one. Today, we’re making the latest version of our image captioning system available as an open source model in TensorFlow. This release contains significant improvements to the computer vision component of the captioning system, is much faster to train, and produces more detailed and accurate descriptions compared to the original system. These improvements are outlined and analyzed in the paper Show and Tell: Lessons learned from the 2015 MSCOCO Image Captioning Challenge, published in IEEE Transactions on Pattern Analysis and Machine Intelligence. .... "
Today: Our Cognitive Systems Institute Group Speaker Series this week, Thursday, September 22, 2016 at 10:30 am ET US (9:30am CT, 7:30 am PT). Our presenter this week is Erin Walker from Arizona State University, who will be presenting "Designing Social Interactions in a Teachable Agent." Slides. Please point your web browser to https://apps.na.collabserv.com/meetings/join?id=2894-8491 Password is Cognitive Use audio on computer or 855-233-7153 in the US (other countries numberhere) PIN Code: 43179788 Non-IBMers and Non-Members, please use the "guest" option instead of entering your email. Group https://www.linkedin.com/groups/Cognitive-Systems-Institute-6729452 and please ask questions at the end of the call. ... "
A critical view in a study of online training, aka MOOCs. Massively Open Online Courses. Not unexpected that those who use these methods do not get the same quality of education as individual, face to face teaching. Not unexpected to hear this. But the economics involved? In the HBR, useful thoughts on decisions, data and organization. polarizing operating principles. On the one hand, they desperately seek greater agility; on the other, they genuinely want to include all the right stakeholders in their processes. This conflict uncomfortably transcends traditional “centralization/decentralization” debates. Customers and clients demand greater agility, and employees and partners expect greater empowerment. So the companies push hard to provide both. Including more people, alas, typically increases coordination costs and response times. But, almost paradoxically, greater organizational agility requires greater responsiveness and improved coordination. The more stakeholders involved, the more likely that decisions are delayed. But effective agility frequently demands inclusive stakeholder involvement. In other words, more people want to make more-agile decisions more often. This tension drives my clients mad. At one Fortune 1000 company, for example, “flame wars” broke out between customer support units, desperate to respond faster to customer complaints, and the technical design group, equally desperate to avoid ad hoc fixes. Neither group could effectively solve the problems without the other, but their overlaps quickly became sources of conflict rather than collaboration. That pathology isn’t uncommon. The digitally networked enterprise — whether Slacked, Chattered, Skyped, Google Doc-ed — sharply exacerbates tensions and pain points: More stakeholders can instantly access, and share, actionable information. Technology facilitates greater transparency and visibility throughout enterprise ecosystems. Real-time situational awareness dramatically increases. But the managerial and operational ability to act on that data-driven information may not. By far the best and most useful approach for managing those tensions is Michael Jensen’s path-breaking work in decision rights a quarter-century ago. Simply put, decision rights clarify authority and accountability for decisions and decision making. Decision rights are about how organizations “decide how to decide” who is empowered to make decisions. Think of it as a governance model for enterprise decision. .... "
First via a messaging App called Allo, later in the fall via Google Home to provide a competitor to Amazon Alexa and Siri. Claims for better AI. In Adage: " ... Watch Out, Siri and Alexa: Google's New Digital Assistant Is Here ... "
More on the release of the Google Allo App. And how Google plans for leadership in assistant AI. (Update) "It's really important for Google, as the company has bet its entire future on A.I.," said Patrick Moorhead, an analyst with Moor Insights & Strategy. "Their CEO Sundar Pichai said at I/O his company is no longer a mobile company, but an A.I. company. Allo needs to go really, really well. They're on stage here." A critical look at Allo's value. Does this mean that the Chinese culture is more prone to wearable devices? In Readwrite. " ... China may become the world’s largest wearable customer in 2017, if sales continue to surge as they have in 2016. In the past year, the country has seen an 84 percent increase in wearable sales, reaching 9.5 million between April and June this year. ... "
" ... According to RSR’s benchmark report on omnichannel order profitability, unpredictable consumer demand is the top business challenge among retail respondents. After much consideration, I would offer that consumer demand isn’t really that unpredictable. Instead, retailers are just really bad at predicting it. Part of the issue is one of “garbage in” — as in, “garbage in yields garbage out.” There seems to be a lot of garbage in the inputs retailers use to decide what to stock where. First, a lot of them start with last year’s plan, which means the bad assumptions made last year are automatically carried over into this year. ... "
Interesting security application. Not new, but alternative applications of beacons. Note regulatory application. Thanks to a system provided by Barcoding Inc. and Visybl, Mount Airy Casino Resort is alerted if an employee begins to remove a key from its facility, enabling it to prevent regulatory infractions. Update brought to my attention. Have looked at the implications of smart contracts. Worth understanding. The Hyperledger Project is a collaborative effort created to advance blockchain technology by identifying and addressing important features for a cross-industry open standard for distributed ledgers that can transform the way business transactions are conducted globally. The Project is a Linux Foundation Collaborative Project and implements many open source best practices familiar to other leading projects. Not since the Web itself has a technology promised broader and more fundamental revolution than blockchain technology. A blockchain is a peer-to-peer distributed ledger forged by consensus, combined with a system for “smart contracts” and other assistive technologies. Together these can be used to build a new generation of transactional applications that establishes trust, accountability and transparency at their core, while streamlining business processes and legal constraints. Only an Open Source, collaborative software development approach can ensure the transparency, longevity, interoperability and support required to bring blockchain technologies forward to mainstream commercial adoption. That is what Hyperledger is about – communities of software developers building blockchain frameworks and platforms. .... "
Today, GE Digital, the company’s software arm, said it acquired Meridium, Inc., a leading developer of asset performance management (APM) software for machine-heavy industries such as oil, gas, electricity and chemicals. The deal values Meridium, based in Roanoke, Virginia, at $495 million. GE first invested in Meridium in 2014, buying a quarter of the company. Today it purchased the remaining stake. “As we forge ahead in the Industrial Internet journey, APM is clearly the first application that can leverage the Predix platform to help industrial customers benefit from increased productivity,” said Bill Ruh, CEO of GE Digital. ... "
Long ago I took a course on language theory. Have since remained intrigued about how the evolution of the field ultimately links to Natural Language Processing (NLP), and ultimately intelligence and how we perceive and interact with our world. Some of our efforts sought to program bots to communicate. Seems this would be a good place to consider the language a Bot might use. So for you that have not taken the course. Here is a portion of the intro to Ling001 at the University of Pennsylvania as it is taught this fall by Mark Liberman. Also the slides that Liberman uses. Make no claim that I understand all this, but it makes me think. Also their Language Log blog. Tom Davenport will be the virtual presenter for the Columbia School of Professional Studies MS in Information and Knowledge Strategy and MS in Applied Analytics programs. He will share his recent research on the human implications of cognitive technologies, and discuss what they mean for contemporary knowledge work. He'll also explore their impact on analytics and knowledge professionals' jobs. What new responsibilities and skill-sets will emerge in the corporate, non-profit and public sectors? Please join us for this lively and interactive virtual session, which kicks off our 2016-2017 community presentation series. A new study by Deloitte showed that 56 cents of every dollar spent in stores is influenced digitally. By Evan Clark .... ". I am personally surprised it is not a larger percentage. A look at content generation using smart machines. A newly discovered philosophical blog. Lots of companies are considering the implications of AI today. Actually have heard relatively little lately about cooperative innovation lately. Good to see this from the Cisco blog describing some of their efforts, with some interesting examples. And another post on defining co-innovation. It was decades ago when science fiction great Isaac Asimov imagined a world in which robots were commonplace. This was long before even the most rudimentary artificial intelligence existed, so Asimov created a basic framework for robot behavior called the Three Laws of Robotics. These rules ensure that robots will serve humanity and not the other way around. Now the British Standards Institute (BSI) has issued its own version of the Three Laws. It’s much longer and not quite as snappy, though. .... "
Of interest, where are the ethics actually embedded? Clear and specific 'rules' or embedded in a pattern matching neural network? Starts to becomes an issue of legal interpretation we have just started to explore. I was late to learn about this, but here from Microsoft Research about an aborted chatbot called Tay, operating on Twitter, that apparently turned abusive. No mention here of MS's much better known bot Cortana. You do wonder that any kind of chatbot that attempts casual chatter might be prone to this. Our own experiments were closely examined by lawyers.
" ... For context, Tay was not the first artificial intelligence application we released into the online social world. In China, our XiaoIce chatbot is being used by some 40 million people, delighting with its stories and conversations. The great experience with XiaoIce led us to wonder: Would an AI like this be just as captivating in a radically different cultural environment? Tay – a chatbot created for 18- to 24- year-olds in the U.S. for entertainment purposes – is our first attempt to answer this question. ... "
Let’s take a minute to define what we mean by the connected consumer. First, let’s not get too focused on the idea of Millennials or Generation Y – users of all ages are very active on their mobile devices and social media. What we are talking about is not an age group, but a group of consumers that is always connected via their smart devices. Second, they are on those devices a lot. Customers look at their smartphone about 1,500 times a week, and are on their phones 174 minutes per day. To put this into context: Studies show that mothers spend an average 117 minutes a day on childrearing, while men spend 62 minutes per day! Finally, today’s shoppers are looking for what Cisco describes as a “contextual relationship.” In other words, they have high expectations for their relationship with you. They expect you to know about them, what they have been doing, and what they are doing right now, during every interaction; and they want you to use this context to guide how you respond. ... "
Fascinating short piece. Will this allow us to pay less attention to architecture of neural networks? Technical. Will take some time to digest. The term 'Generalized' warms your heart, but then you have to challenge: How general is it? And how stable for all problems? We introduce a new Machine Learning (ML) solution for Dynamical, Non-linear, In-Stream Analytics. Clearly, such a solution will accommodate Static, Linear and Offline (or any combination thereof) Machine Learning tasks. The value of such a solution is significant because the same method can be used for classification and regression (including forecasting), offline and real-time applications and simple and hard ML problems. ... "
Also, want to let you know that IBM will have a presence at two upcoming conferences: World of Watson in Las Vegas starting with an Academic Workshop in Cognitive and Data Science on October 23 (Conference 10/24-27) and Educause in Anaheim, CA October 25-28. Let me know if you would like more information on registration costs and agendas. I recall reading about this some time ago, and wondering about the value of such methods. Our own R&D groups had looked at solving related problems. Here is an update I caught. Perhaps the best example of value from gamification. It's proof that crowdsourced science can solve problems quickly. It's no great shock to see citizen scientists make discoveries that professionals miss, but making it through a video game? That's different. Gamers playing Foldit, a puzzle title that has teams trying to fold the best protein, have identified the shape of a protein before scientists (including two trained experts and 61 University of Michigan undergrads) could manage the feat. And it's not as if there were legions of contributors, either, as it took a relatively modest 469 players to help out. The protein in question may be particularly significant. It prevents plaque formation, hinting that it might help fight Alzheimer's if and when the medical community develops a practical use for it. ... "
On the Science of Foldit. I Have been following D-Wave Quantum Computing for some time. And yes, if this plays out, it may well revolutionize aspects of machine learning. D-Wave has been used by NASA and Google. See my previous posts regarding D-Wave. D-Wave's upgraded quantum processor, which is scheduled for release in 2017, promises to manage about 2,000 quantum bits (qubits) and solve certain problems 1,000 times faster than the existing D-Wave 2X processor. "We've been on a trajectory, which has been doubling the number of qubits pretty much every year," notes D-Wave's Colin Williams. He says the D-Wave system harnesses various atomic behaviors, including entanglement and state superposition, to solve a spectrum of complex computational challenges. The systems are specifically designed to conduct unconstrained binary optimization, along with related sampling problems. D-Wave says the specialized work of the upgraded processor could be particularly applicable to training unsupervised machine-learning models. Williams thinks this aspect of the processor could have the greatest benefit, helping in the creation of "a machine that, having trained it, can...generate new data that is statistically indistinguishable from the kind of data on which it was trained." Ultimately, Williams envisions the D-Wave chip working alongside classical processors rather than supplanting them, and he rejects the notion that the chip's specialized nature limits its utility. "It's actually been shown that the one thing it does, can be used in lots of different fields," Williams says. .... "
The study, “The New Digital Divide: The future of digital influence in retail,” pointed to the limitations of a single retailer creating a “meaningfully personalized experience” with its customers. They estimated that the customer likely interacts with a retailer six to eight times per year and mostly in a transactional manner. .... "
Interesting collaboration of players in advertising, retail, measurement and loyalty systems. UK — Nielsen is collaborating with Sainsbury's and Nectar card owner Aimia's partnership i2c on a venture to demonstrate the impact of digital ads on shopping behaviour. ... "
An interesting, relatively focused example, of an AI assistant capability. Once a few of these take off, people will expect this kind of assistance. Have not examined this yet. Everyone wants call notes but no one wants to be stuck taking them. Now there’s personal assistant AI for that. of Artificial Intelligence by Robert D Atkinson. about where to go on vacation or what to buy. Although artificial intelligence has become commonplace—most smartphones contain some version of AI, such as speech recognition—the public still has a poor understanding of the technology. As a result, a diverse cast of critics, driven by fear of technology, opportunism, or ignorance, has jumped into the intellectual vacuum to warn policymakers that, sooner than we think, AI will produce a parade of horribles: mass unemployment, abuse from “algorithmic bias,” the end of privacy, an atrophying of human agency, and even the destruction of humanity, as “Skynet”-like machines decide the world is better off without us. Indeed, these voices have grown so loud, espousing a message that a click hungry media eagerly amplifies, that we are very near the point where these narratives may be accepted as truth. Needless to say, when AI is so vociferously demonized (indeed, the engineering magnate Elon Musk has explicitly warned that AI could be “the demon” that threatens our existence, especially if actions are not taken to design systems that can remain under human control), there is a real risk that policymakers will seek to retard its progress. .... "
A retailer can connect the Mirror to a TV through HDMI and USB, usually found on the side or back of the TV. Once connected, the beacon can pair with a nearby smartphone and send relevant data to large displays, which can show additional details. Estimote gives a few examples, an airport screen could provide personalized data of your flight and the easiest route to the gate; a retailer could tell you if a shoe is available in your size. Connecting multiple displays—a smartphone and a TV—gives retailers more opportunity to entice customers. A retailer might check your recently searched Google results and show applicable products at the store window, with a reduced price. In Fastcompany: Still a debate. The key may be to just do it at all with as many participants as possible. I like this series, which also links to related research. This Is How To Be More Assertive: 3 Powerful Secrets From Research. In particular in this edition: "How to Say No." Everyone needs that advice. I do. Continued interest by big players in Virtual and Augmented reality moves. Lets see the big workplace applications. Apple CEO Tim Cook has been hinting at Apple's interest in augmented and virtual reality all year, and it seems that interest continues to grow. Business Insider spotted two people who were hired by Apple over the summer after working at a pair of the biggest names in field: one at Oculus VR, the other at Magic Leap. The two hires don't mean much on their own, but they suggest that Apple is continuing to invest in AR and VR research with the goal of eventually putting out a product. In January, the Financial Times reported that Apple already had "hundreds" of people working on AR and VR, though those employees were said to have come from acquisitions of smaller companies. Their goal, according to the report, was to eventually build some kind of headset. ..... "
Though I came from one of the most successful storytelling (marketing) companies, its still rarely thought of in the realm of their engineers and analysts. Because it rises too far apart from data and model? Same problem exists with really trying to understand the business process, a story in itself. Is that a way to bridge the gap? Digital storytelling is crucial in customer experience. Before we get deep into digital storytelling and how to maximize your processes around it, let’s briefly set up why storytelling as a whole — and especially digital storytelling — is important in the current business climate. Excellent piece. I have been involved in several projects which look at the correctness of algorithmic methods. One point to make where a distinction is necessary. A Black Box model implies the details of how and/or why a model works are unknown or are being hidden. An algorithm usually implies the how/why of the model is known. But its precise parameters may or may not be revealed. 'Black Box' implies fewer details are being revealed, and usually makes me worry more about the stability of the method being used. The topic explored in this article below will become more crucial. Algorithms need to be judged correct and compared for specific contexts. The great question of the 21st century: Whose black box do you trust? Algorithms shape choice not just for consumers but for businesses. The role of technology-fueled algorithms in shaping our society, and how to use them responsibly, is one of the topics I'll be exploring at the Next:Economy Summit in San Francisco, October 10-11. Join me there. A lot of attention has been paid to the role of algorithms in shaping the experience of consumers. Much less attention has been paid to the role of algorithms in shaping the incentives for business decision-making. .... "
Well put. Gaming will always be there, but real, practical uses will open many more possibilities. I had two different applications for Glass posed to me, but got no support from Google to develop these. Make sure the applications have real value, and can't easily be made fun of. In FastCompany: Well thought out piece. Where Google Glass failed, Hololens seems poised to succeed as a tool for the working man rather than a consumer headset for gamers. ... "
I still prefer the term 'Augmented Reality' to Microsoft's 'Mixed Reality'. Interesting use of the smart contract idea by very digital companies. The example of its use and value is very useful. Note the Open Source use of Hyperledger. SINGAPORE - 16 Sep 2016: IBM (NYSE: IBM) today announced it has signed a contract with the Bank of Tokyo-Mitsubishi UFJ (BTMU) to examine the design, management and execution of contracts among business partners using blockchain technologies. The two companies will begin by piloting blockchain to automate business transactions between the two companies. IBM and BTMU have built a prototype of smart contracts on a blockchain to improve the efficiency and accountability of service level agreements in multi-party business interactions. The bank plans to begin using it to manage contracts within their business in fiscal year 2017. In addition, IBM and BTMU aim to manage agreements between the two companies with the system by the end of fiscal year 2017. To help improve efficiency, IBM and BTMU will monitor delivery and usage of equipment with a sensor that embeds information into the blockchain. This will then automate invoicing and payment processes between the two companies. .... "
In DSC, a visualized analysis of Yellow Taxi Cab data about NYC using R. Gives an example of what can be done. Is this useful for Uber? For an understanding of what a driverless car world might look like? For future smart city planning. The future city is a digital city. I always start with a visual of the data involved, and make the visualization interactive if at all possible. Via Sam Savage. Industrial Monte carlo simulation was commonly used in our enterprise as an analytic method. . It has been a method around for a very long time. A favorite of mine because it can be used to understand process operation and performance. They point to a number of resources I did not know of. In the past these systems tended to be expensive for the individual to use. Note also their use for Reinforcement Learning, also covered here recently. Free tools from ProbabilityManagement.org automate the data table process for Excel users. Monte Carlo simulation has been used to model uncertainties since the Manhattan atomic bomb project by blasting randomly generated inputs through mathematical models. Monte Carlo spreadsheet add-ins for personal computers have been available since the mid-1980s, however, it has not been a killer app because it takes specialized training to generate the required random inputs. Actually, a great invention of the 19th century, the light bulb, was never widely adopted because it took specialized training to generate the required electricity (just kidding). Thomas Edison subsequently proposed that experts with generators provide electricity for non-experts with light bulbs, and the result was the power-distribution network ..... "
come out of this evolution.
" ... Today’s announcement—putting the Weather Company API on BlueMix—means it will be less of a hassle for developers to add weather data to their next great app. “If you were building an app on BlueMix and wanted to add weather prior to this Weather Company add on, you’d have to open a new window go to the Weather Company’s platform, get an API key, deal with billing, subscription services, all the normal administrivia that comes from sourcing data from many places,” says Bryson Koehler, the Weather Company’s chief information and technology officer. Which isn’t necessarily a huge pain, but think about it this way: If you were building a couch, would you visit one store for the lumber, another for the screws, another for the saws to cut the lumber, another for the drill to use the screws … or would you just go to Home Depot and grab all that crap at once? .... "
But hey, not everyone likes Home Depot. So how is BlueMix as a one-stop API shop? (If you don’t know, APIs are programs that let other programs and apps talk to each other.) Well, it’s IBM, so it is pretty thorough. Beyond the basic starter kits for various API fucntions (banking, Internet of Things, cloud computing), it lets you access cool stuff like Watson’s cognitive computing tools, so you can do creepy things like build psychological profiles of the consumers using your app. .... "
With an innovation portfolio that ranges from medical devices to folding bicycles to social-impact enterprises to junk food, Wharton professor Karl Ulrich has every justification to bask in entrepreneurial mystique. Only that’s exactly what he sets out to demolish in the classroom.